<Handling long hair, for the first time in your life! 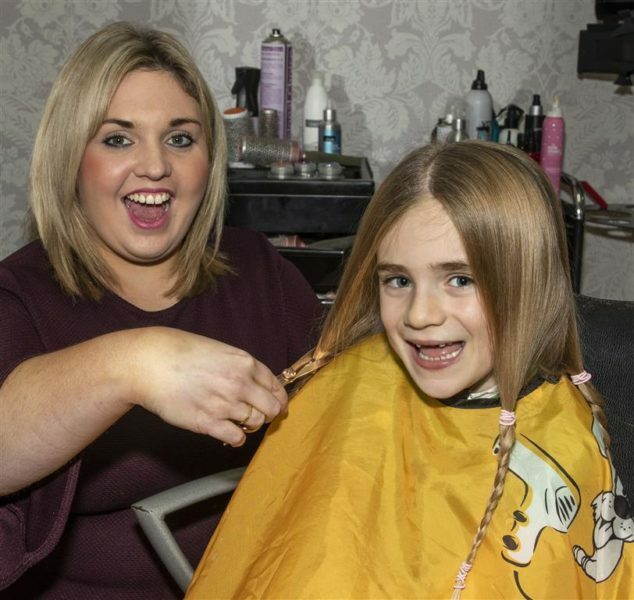 Kayleigh Bullingham, owner of Diamond Cuts salon in Coventry is quite used to cutting children’s hair. But cutting 12 inches of 7-year-old Hope Davis’ hair was a little bit special. The child had asked to have her hair cut so she could send it to another child who had lost half of her hair through cancer. Although Yolande and husband Wayne have never had their daughter’s hair cut from birth, apart from trimming the ends, they were proud of their daughter’s selflessness, and so did some research into donating hair and discovered the Little Princess Trust. The charity provides real hair wigs free of charge to children and young people up to the age of 24 who have lost their hair through cancer treatments and other illnesses. Since the Little Princess Trust’s inception in 2006 it has helped thousands of children by providing wigs for them and has received the Queen’s Award for Voluntary Services, the MBE for volunteer groups by Her Majesty the Queen. Hope’s mum then asked around for recommendations for a local hairdresser who would cut her daughter’s hair, and Kayleigh of Diamond Cuts was recommended. The whole event went well, although Hope’s parents found it a little emotional, and they weren’t alone. Two of Hopes brothers went along to the salon with their parents, as well as Hope’s Godparents and her best friend, Grace. This is my daughter and I am immensely proud of her.